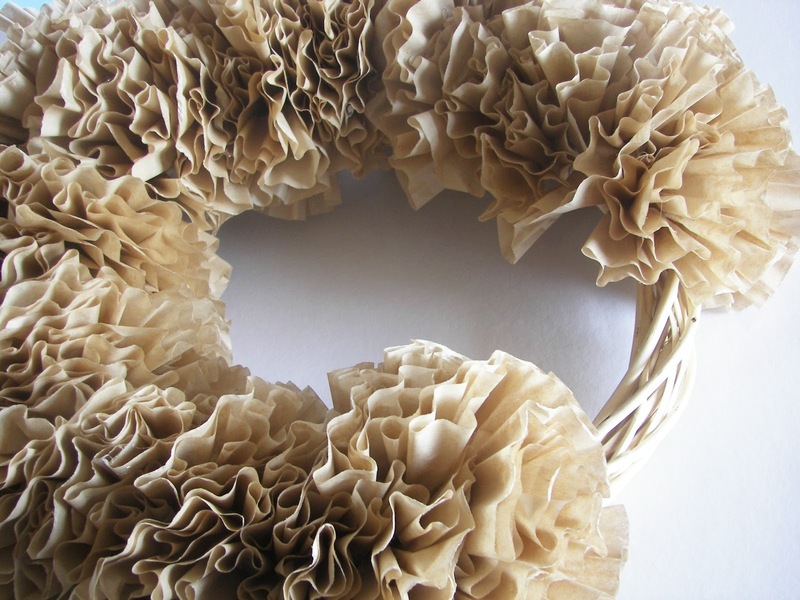 It seems as if everyone has made a coffee filter wreath, but me. What a great looking wreat for under $3.00. I was inspired by one that I saw on the blog Little Brown House. This comes together so easily and only takes about an hour to make. 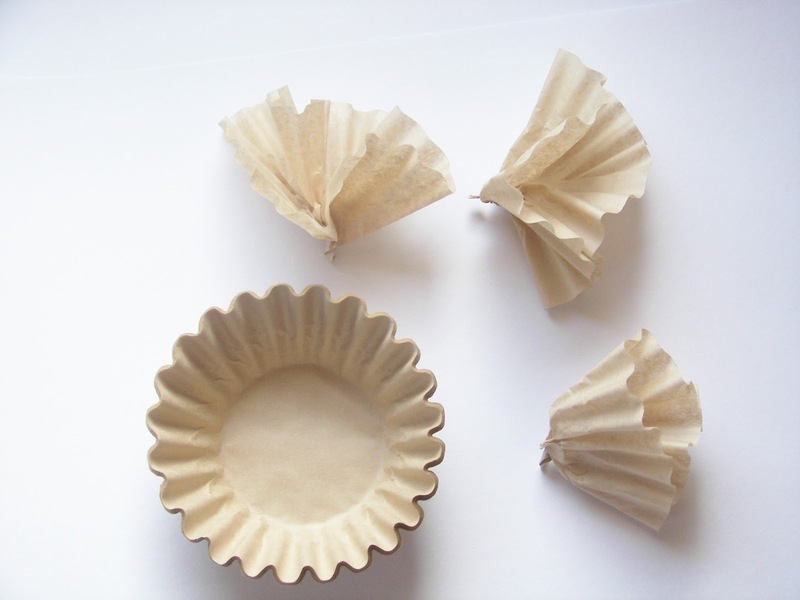 coffee filters. I bought the wreath at the Dollar Store. Just pinch together the center of the coffee filter, as shown in the picture below and then add glue to the wreath form. It is so full and fluffy that it reminds me of hydrangeas. This wreath is really wonderful, just think you could take it up a notch and put some glitter on it for the holidays. Thank you for sharing. These is adorable! I think I know what is going on the wall as you head down the stairs now. I have never made one, Joni. I even have a the plain wreath already. I bought it for a Peeps wreath, but it's not going to happen:) Hopefully I can handle it. Have a wonderful week! Great job on the wreath! I just did a book page one and felt like I was the last one to the party! This is the first time I have seen one of these though. See how much I get out?! I haven't made one either so don't feel too bad. It does look like faded hydrangea blooms! Very pretty. It's lovely and you are NOT the last. I haven't made mine yet, and I've been dying to. Nope, I haven't made one yet either! I think it turned out so great. We had someone do balls like this for a wedding and she did them with cupcake cups, in neutrals and whites, then hung them with taupe satin ribbons. Seriously, this is all the fad now???? 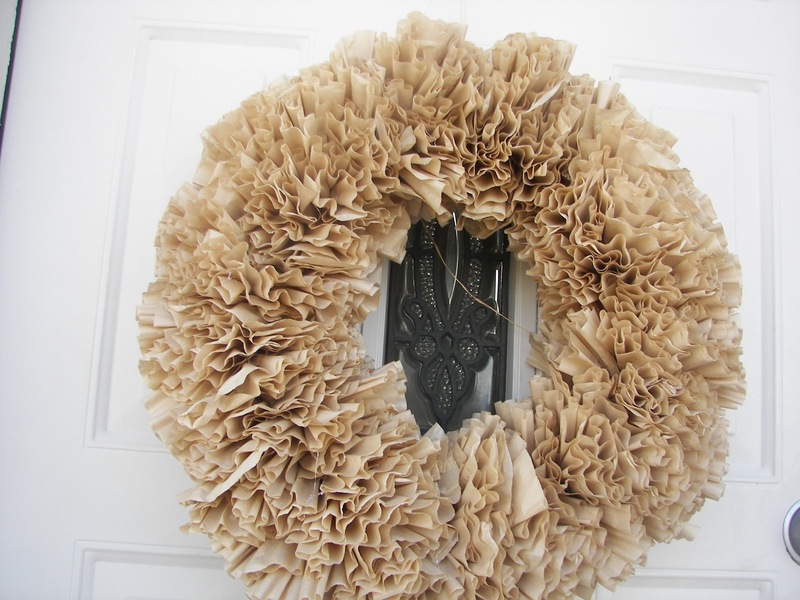 That's about as crazy as the wreath I saw last week made from telephone pages. Haven't made one either. Super cute!!! That is really lovely. I haven't made one yet, so hey, you aren't the last person on earth to make it! hehe. Well I haven't tried one yet. Crafting doesn't come easy for me, so I assumed I would mess one up. I do love the look! I've seen the cupcake liner art, but not the coffee filter wreath so this is new to many of us ;) It's beautiful! I SO want to get a storm door so I can have gorgeous wreaths like this on our front door! Thanks so much for sharing! LOVE LOVE LOVE! Thanks for sharing this! I've seen them with white but I LOVE the tanish-brown color!